We’re ready to make your next app success. Tell us more about you and your Project. Drop us a message, and we guarantee to get back to you within 24 hours. 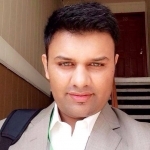 Umair Khan is a digital strategist & transformation specialist, lean startup adviser and marketing technologist. Providing technology and BPO consulting services to countless international brands and companies over the years. Passionate about learning new tools, technologies, methodologies and processes. Love meeting new people, exploring cultures and discussing ideas. Our experienced team helped more than 150 startups at various different levels to their journey to greatness. We build startup businesses from their initial concept designs to establishing as a corporate empire. We worked closely with our partners to collaborate, support and suggest the best technical path-ways for initiating a new startup app idea.